I’m sure it’s no secret that I’m in love with potatoes and potato dishes. I make a lot of them and I have absolutely no shame over that. Potatoes are so versatile, that it’s a lot of fun to see how many different ways I can use them in a recipe. Potatoes Au Gratin is a classic recipe but it’s one of my favorites by far. There are many fancy ways you can use potatoes. I’ve seen them carved into beautiful shapes like flowers and people’s faces, however, you can’t beat the classics. 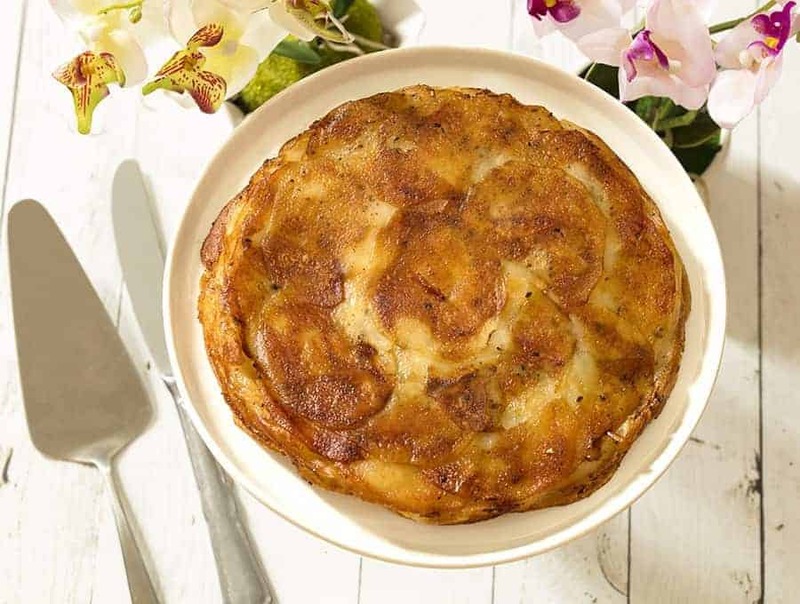 These Potatoes Au Gratin are pretty easy to make and always make for a crowd-pleasing dish. Of course, even if you don’t have a crowd, the family will love them and be back for seconds. If you haven’t gotten an Air Fryer yet, you’re missing out. 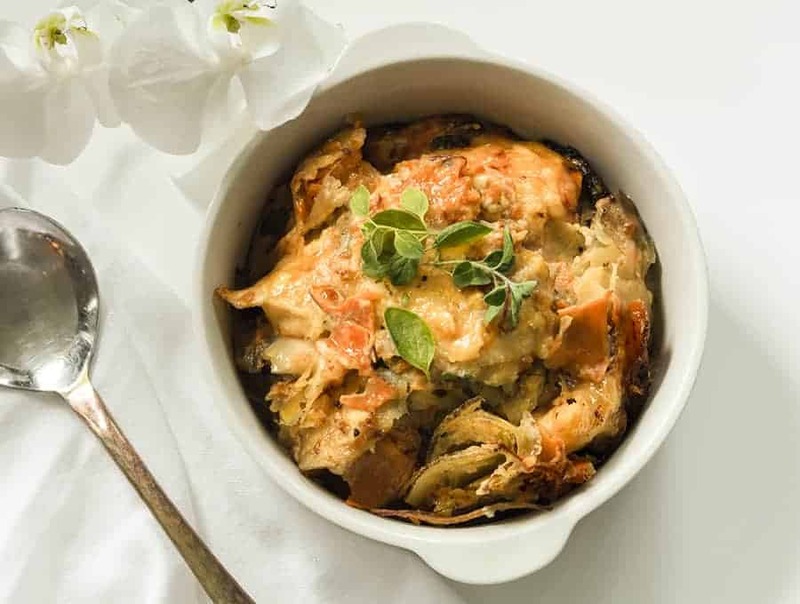 Not only do they make dishes like these Potatoes Au Gratin so much easier to prepare, but they also make them a little healthier. An Air Fryer needs hardly any oil to function. This means your usual dishes that are bogged down with oil, won’t be! It’s a lot easier to slice the potatoes for this dish by using a mandolin slicer. Be careful though, don’t go for a cheaper mandolin slicer as it’s easy to cut yourself on those. Be sure you get one with a guard so your fingers will stay intact. 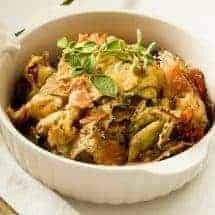 it’s well worth it though and you can use it for many more of my recipes outside of these Potatoes Au Gratin. What Does Au Gratin Mean? Typically this refers to a casserole where you’ve created a browned crust on top of a dish. Sometimes this is done ith breadcrumbs, sometimes cheese–or if you’re craving some good old fashioned American topping, I’ve seen this done with crushed, buttered corn flakes. I will not judge, because by golly that cornflakes topping is delicious! I debated whether these were au gratin or not, since I don’t use a topping for them. But the simplest way to get a browned crust on these–and also a delicious way to do that–is to top with grated cheese for the final 2-3 minutes of cooking. If you’re looking for more deliciously savory potato air fryer dishes, check out my Rosemary Roasted Potatoes! They take very little effort and are absolutely delicious. 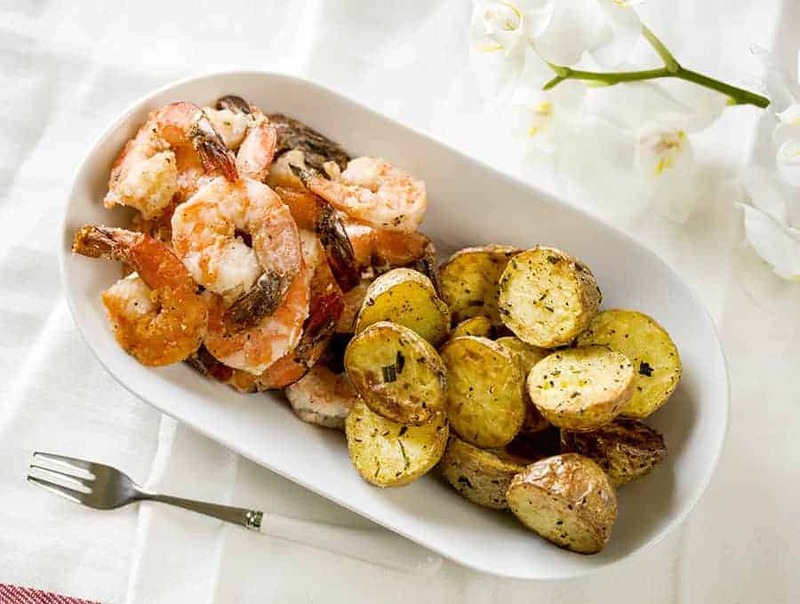 Another great potato side dish option is my Potatoes Anna recipe. With just 4 simple ingredients you can make a delicious and elegant dish that you’re sure to love! I absolutely love side dishes containing potatoes. 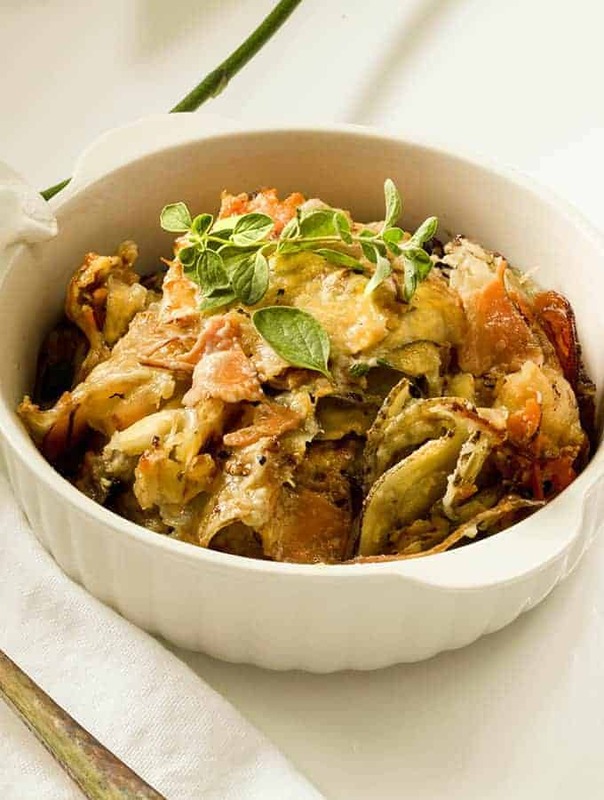 These Potatoes Au Gratin are only of my favorites but, they’re always at the top of my list. They’re quick to toss together, and they always come out with the perfect texture and flavor. I guarantee the entire family will be in love with this dish. I know mine was! Make these savory, cheesy Potatoes Au Grain right in your air fryer, leaving the oven open for the main course! They're a delightful side for most any meal! Spray a 6 x 3-inch round baking pan and set aside. In a blender, blend together the cream, onion, shallot, garlic, thyme, salt and pepper, until smooth. In a large bowl, mix together the russet and sweet potato. Drizzle with oil. Add salt and pepper and toss to coat. Place the potatoes in the greased pan. Pour the whipping cream mixture over the top of the potatoes. Cover with foil and place in the air fryer basket. Set the air fryer to 350°F for 40 minutes or until potatoes are nearly tender. Uncover and top with grated parmesan. Set the air fryer to 400°F for 5 minutes or until the potatoes are bubbly with a golden brown crust. 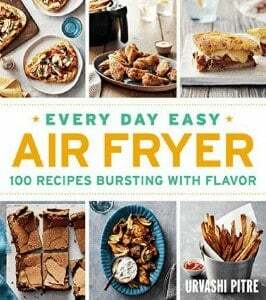 Don’t forget to check out my Air Fryer Cookbook! Every one of the recipes in this book can be made in an hour or less, and many are on the table in as little as 30 minutes. You won’t find “cream of anything” cans in the ingredient list: instead, you’ll start with fresh ingredients–healthful meats and vegetables–and let the air fryer do the hard work. Unleash the full potential of your Air Fryer and eat healthfully every night.